This is an image of the goddess, Sarilla, in the gardens of her great temple in Asharun. It was painted by Samantha Fanti. I should emphasize that this image is for promotional and creative purposes, to help us as we craft the setting for Sertorius. The final book will have interior black and white images and this is for our websites leading up to release. As with prior previews, I will use it to discuss some relevant parts of the setting. What follows is text taken from the rulebook (things are still in development so much of it could change). Sarilla is the goddess of fertility and love. She is the former consort of Senga, the god of the ogres whose death over 1,000 years ago ushered in the age of magic. She may bear some responsibility for his death, and likely crafted the blade needed for the task from her own spine. But she is not an evil deity. Sarilla’s true motives are not easily deciphered. To this day she still mourns Senga. Her reasons for killing him are unclear, they may have been born out of loyalty to him, perhaps a secret purpose only Senga knew, or they could have been selfish and an effort to steal his power for herself (perhaps she doesn’t even know why she did it). 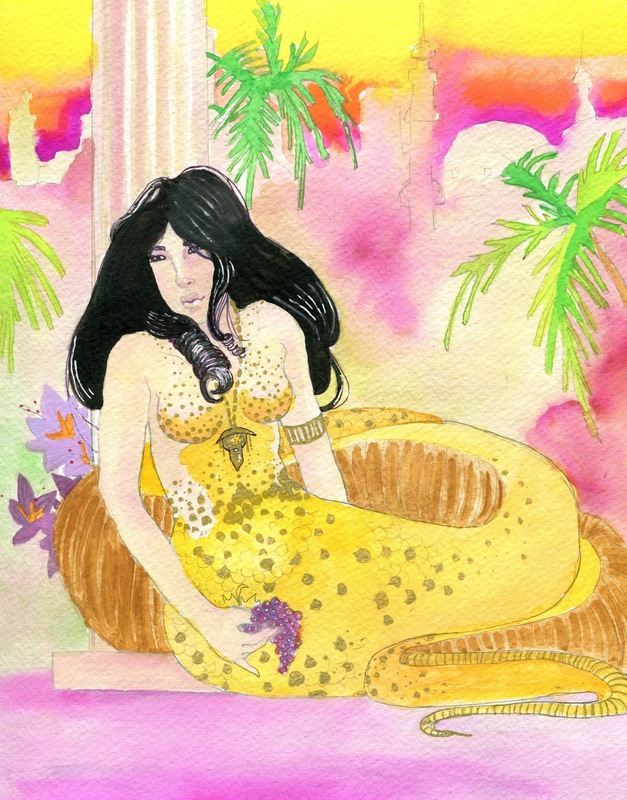 Like all gods in Gamandria, Sarilla can take any form she desires, but her preferred form is that of a snake-woman with yellow scales and long dark hair. She dwells in a secret realm beneath the city of Asharun, near a set of columns called the Pillars of Life. Between these pillars the Asharuni make sacrifices to their goddess. … Hasri are quite capable of love and of forming powerful emotional bonds with a single individual. But this is not associated with child rearing or reproduction. Hasri often consider their love more pure than the love known by most other races because it is unfettered by the needs or desires of the body and exists (for them) on a higher level. Here is a first-look at the new logo for Sertorius. We are working on the cover art now and hope to have a preview of that for you soon as well.